WASHINGTON—There’s a connecting thread, a direct correlation between the activism and resistance of American women between 2017 and 2019. 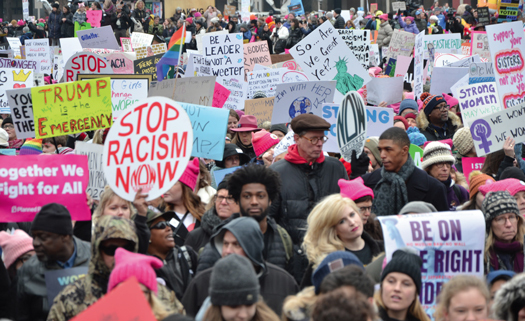 Millions of women took to the streets in 2017 to express outrage at the selection of Donald J. Trump as president, to protest the steady and unrelenting attacks on women by reactionary elements of society. That march has gone down as the largest single-day demonstration in America history, illustrating the potential power and political impact women have while allowing to build community. The next year, March organizers kicked off Power to the Polls, an aggressive nationwide plan to harness the burgeoning grassroots resistance to Mr. Trump and his far-right agenda and channel that energy into campaigns to elect progressive victories in the 2018 midterms. 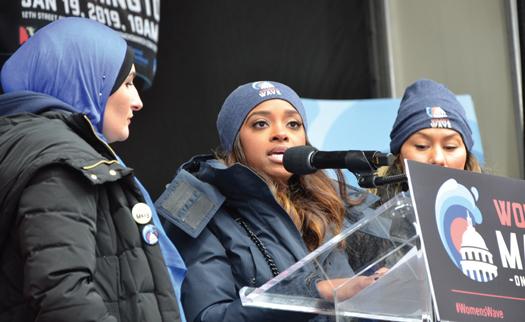 During the 2019 Women’s March, co-chairs Linda Sarsour and Carmen Perez outlined a progressive policy agenda, released Jan. 18, that builds on gains of the record-breaking midterm elections, seeks to codify protections for a wide cross-section of women, lists legislative and policy priorities, and also works to ensure that elected officials on the federal, state and local level are held accountable. Other policy priorities that are addressed in the 71-page document are violence against women, LGBTQIA+ rights, immigrant rights, universal health care, publicly available abortions and support for the Boycott, Divestment, Sanctions (BDS) movement. The BDS movement is a Palestinian-led movement inspired by the anti-apartheid movement that toppled the White minority regime in South Africa. Organizers say they are seeking freedom, justice and equality and urge pressure on Israel to comply with international law to ease the suffering of the Palestinian people. Medea Benjamin, co-founder of CODEPINK! Women for Peace, said the Women’s March was a manifestation of the deep concern, anger and frustration women and their allies have as they’ve watched the Trump administration work tirelessly to erode the hard-earned gains made by women, Blacks and other vulnerable populations. Crucially, she said, the midterms proved to be a crucial turning point. Ms. Benjamin was referring to Democrats’ historic sweep in November 2018 as voter discontent and anger at the direction and policies of the Trump administration led to Dems taking control of the House of Representatives. This election shattered all types of records and the lower chamber now has 127 women with the most Black women, Latinas and other non-Whites in history. The new crop is decidedly progressive and the men and women came in prepared to do battle with the Republicans and an administration whose White nationalist agenda, nativist rhetoric, bigotry and misogyny has driven a wedge ever further between the Whites who support the president, the Republican Party and everybody else. Several of the women who spoke to The Final Call said they believe marching has run its course and applauded the move toward representative politics and consideration of other tangible alternatives. Nana Makini Niliwaambieni, an Akan Priest, educator and mother of five, agreed, but said other issues concern her. “I have not been to any of the marches because I felt once again, that our issues as African women in America would be overshadowed,” she explained. “Few women have the same issues that we have as it relates to racism and the way it is imposed on us. There are other cultures and societies where women are discriminated against because of their color. But we have to deal with the issue of coloration and all that foolishness. We have all these issues. Nana Makini said it’s quite discouraging to see Black people still fighting the same battles as she and her contemporaries did when she was young. “What’s unfortunate to me is that issues are not different from the way they were in the ‘60s and ‘70s,” she said. “We still have young people who’re at the forefront of marches. The issues are exactly the same. I listened to commercials and we’re still marching for the same damn things. Why is that? Nana Makini said the challenging circumstances and conditions that Blacks in America face demand vigorous responses and pushback, but so many people are afraid of losing their jobs, being jailed if they protest and being ostracized for their activism. “Fear starts early. It’s really sad,” she said.